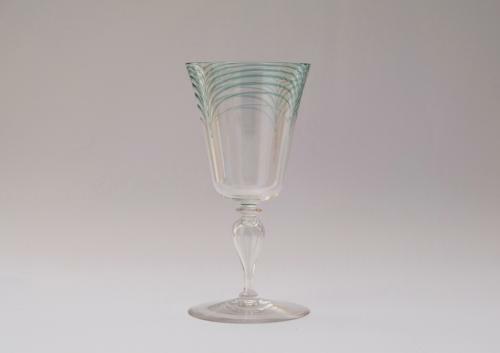 Minerbi wine glass the bowl with melted in pulled up threads on a hollow blown baluster stem. Designed by Harry Powell 1906. Made by J Powell & Sons London. This glass is from a 400 piece service made for the Italian diplomat, Count Minerbi in 1906. Glasses from this service are illustrated in Whitefriars Glass 'The Art of James Powell & Sons' Edited by Lesley Jackson 1996. p.107, plate 45. Marris Antiques specialise in early Whitefriars Glass especially glass by Harry Powell, Philiip Webb and T G Jackson.